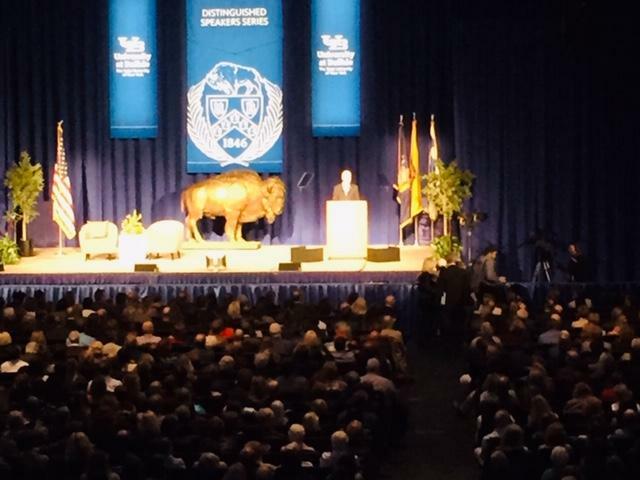 In a speech quoting poet William Butler Yeats and President Ronald Reagan, former Vice President Joe Biden told a University at Buffalo audience political leaders have to "lower the temperature" of politics. 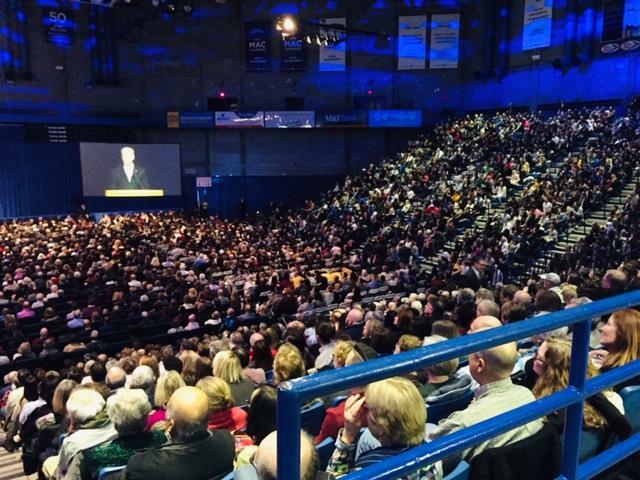 UB undergraduates had chosen Biden as their speaker in the "Distinguished Speaker Series" and the packed house of 6,500 appeared heavily undergrad. The former VP appeared just hours after two mail bombs addressed to him were identified, two in a series sent to critics of President Donald Trump. Biden said the anger and bitterness of current politics isn't American. He said there needs to be a return to traditional political values, that political races have to turn from a struggle of claimed enemies to a struggle over issues. While never mentioning the president's name, the Delaware politician told an appreciative audience reporters aren't enemies of the people and immigrants aren't animals. "Immigrants are not animals (applause). My hope and prayer is that all of our leaders will work to lower the temperature in our public dialogue," he said. Biden said the bombs should wake up politicians. "My hope is this recent spat of these - who knows exactly what they were - but these pipe bombs being mailed might wake everybody in my business up a little bit and realize that we have to begin to put this country back together again," he said. UB Residence Hall President Isaac Reeves told WBFO he was among the students who voted for Biden to come to the campus. The freshman said Biden inspires him. "I eventually want to become president of the United States someday," Reeves said. "I feel just staying for his lecture I can take away a lot of leadership pointers that I can take for myself, you know, to be a better person, to be a better leader." "I'm really excited to see him," said UB student Alize Scott. "I really enjoyed him as vice president to Obama, so I really just want to hear what he has to say. The current White House compared to what it was before is definitely a big issue and try to give us hope for what will come tomorrow because it's not looking too good for us." Jan Robinson said she came to hear some good news. "I've been hearing such negative news," Robinson said. "I like Biden. He has a good spirit. As a mature woman approaching 68 this year, I've seen a lot and I'm really disappointed in what's going on and I just need to be recharged." Daniel Schiffhauer came to see the formr VP as part of a field trip from Iroquois High School in Elma, where former Trump Chief Strategist Steve Bannon led a "Get Out the Vote" rally Wednesday evening. "I came here tonight because I've never been to a political rally before. I'm hoping he'll touch on as many political issues as possible," Schiffhauer said. "I want to get my feet wet with this type of stuff and I think this is just a really good experience for me right now." Schiffhauer said he thinks gun control is a big problem in society right now that needs a solution. During the day, Biden campaigned with Democratic congressional candidate Nate McMurray, opponent to indicted Republican Rep. Chris Collins, in a race that has tightened to the point congressional Democrats see a potential turnover and are putting a lot of money into television ads. The symbolism was apparent, as they stopped for pancakes at the Olive Branch restaurant in Lancaster and spoke with patrons and staff.